Main Setlist: Caroline, Hold You Back, One Man Band, Mystery Medley, Paper Plane, Don't Drive My Car, Dirty Water, Whatever You Want, In The Army Now, Rockin' all over the World, Don't waste my Time, Roadhouse Blues Medley, Burning Bridges, Rain, Anniversary Waltz. Tour Crew: Peter Hillier (Tour Manager), Mike Warren (Sound Engineer), Dave Salt (Stage Manager/Bass Tech), Audrey Carden (Band Personal Assistant), Andrew Carman (Drum Tech), Pat Marks (Lightning Designer), Martin Connolly (Monitor Engineer), Alan "Tonto" Jhowry (Guitar Tech), Alan Beechey (Rigger), Skev Michael (Backline) Merchandiser: BCL Merchandising Ltd. Management: Handle Group of Companies Manager: David Walker. Tour Note: Quo celebrated BBC Radio One's 25th Anniversary at the Sutton Park in Birmingham in front of 120.000 Fans. 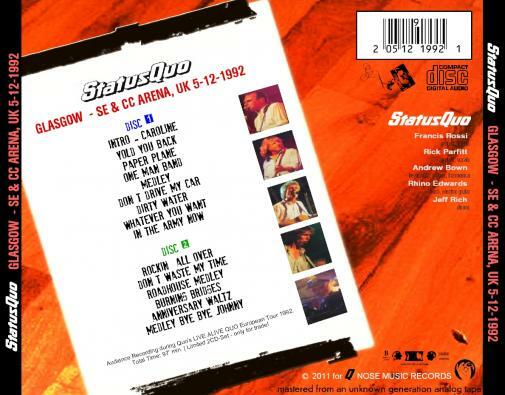 Also special guests were Del Amitri. 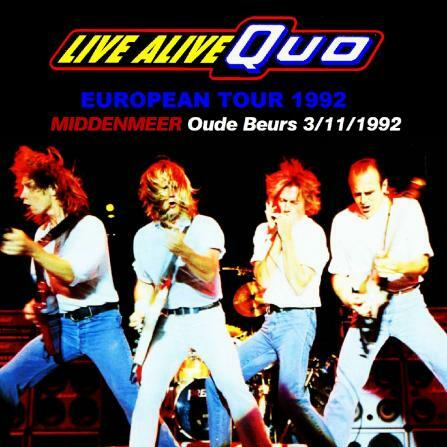 The show were recorded and released by Polydor in November 1992. 19/10/ GERMANY, Berlin - Deutschlandhalle "The Last Tattoo"
09/12/ UK, Birmingham - N.E.C. 11/12/ UK, Bournemouth - B.I.C. 12/12/ UK, Bournemouth - B.I.C. 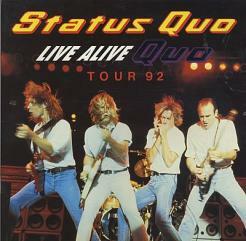 30.08.1992 - Status Quo played at the "Party in the Park" which was held at the Sutton Park, Birmingham. It was because of the 25th anniversary of BBC Radio One. 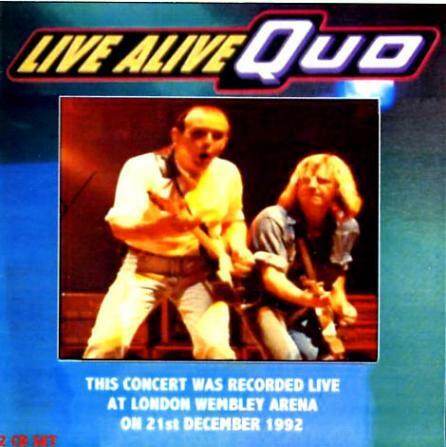 The 125,000 people saw a 45 minutes show of Status Quo. The whole performance was broadcasted at BBC Radio One. Other performing bands were The Farm and Del Amitri. 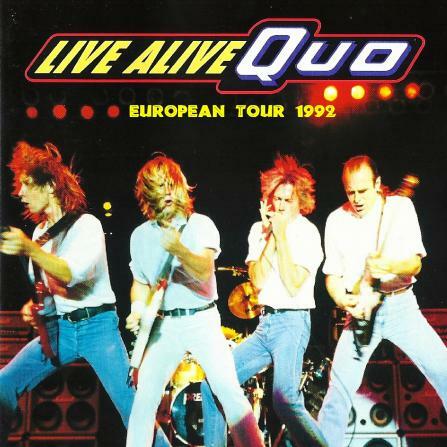 Later an edited version of the song "The Roadhouse Medley" and the album "Live Alive Quo" were released from this show.